A combination of multiple flights, some big training sessions and lots of deadlines had left me feeling a little under the weather (not to mention I moved to a different country during this time). 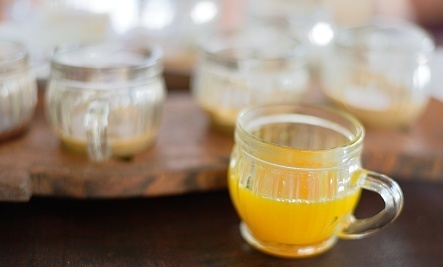 Whenever you start to feel a cold coming on, or feel sick in general, whip up a batch of this turmeric tea. Turmeric is powerful root. Its rich color and distinctive taste make it a staple in many cuisines. Turmeric can lend a depth of flavor to soups, curries or stews. Turmeric (also known as curcumin) has been used for centuries in Ayurvedic medicine. It is used to heal the liver, calm the body and soothe stomach problems. It is naturally antibacterial and antiseptic. Turmeric is also a powerful antioxidant and when ingested it can help to minimize free radical damage to our cells and prevent oxidative damage. The natural properties of turmeric help lower blood pressure, improve blood vessel function and even lower inflammation. Needless to say, turmeric is a super spice with healing properties for the entire body. Take a little time this week to research this amazing spice and find new ways of adding it into your diet. The first step: Making this soothing, healing tea. Mix the honey and the turmeric together until you have a thick paste. This can be stored in the fridge for later use, and will keep for up to three months in a sealed jar. Place one teaspoon of the paste into a mug with the juice of one lemon. Add boiling water, stir well and enjoy. Thank you, my Yoga Therapist wants me to have more Turmeric in my diet, and this is something to try! thanks, i had this recipe and misplaced it.